Last I checked, this anime seemed to be unavailable, though the manga was available at Amazon.com. The above info came from Nhi Le and Kairi, and was edited by yours truly (contact me). The image came from Otaku Aniverse. 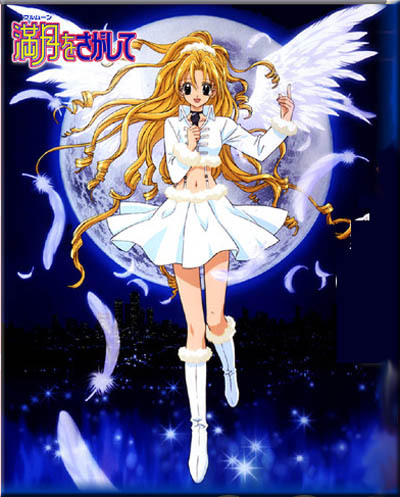 Full Moon Wo Sagashite is about a 12-year-old girl named Kouyama Mitsuki who dreams to become a singer one day. But only two things are stopping her, her grandma and her throat tumour, which means that she will live only for a year. One faithful day, she mets Takuto and Meroko, two death angels who've come to take her away. But they are suprised that she can see them because only the dead can see them. She tells them her story and they feel sorry for her, so they help her fulfill the things she always wantd before her life shortens, like become a singer and finding her long lost love. The above description came from Nhi Le, and was edited by yours truly (contact me). A young girl named Mitsuki wants to be a singer so she can impress a boy named Eichi Sakurai who moved to America, but she has throat cancer and her grandmother does not like music. She has an audition at Seed Records studio but cannot go. Two Gods of Death come and tell her that she has one year left to live. Knowing this, she runs off and goes to the audition. They chase her and finally catch up to her and try to bring her back. They eventually let her audition and turn her into a healthy 16 year old so she may audition. A girl in the audition room tells her that they have already decided on a singer but she goes in and auditions anyway. She doesn't sing loud enough, thinking that she is still sick and cries and tries to run away but Takuto stops her and tells her that she is fine and can sing as loud as she wants. She sings and does a great job, so great that she gets picked. The above description came from Cailey Boyle, and was edited by yours truly (contact me).